"Dedicated to Caring for the Body, Mind and Spirit of our Grandvue Family"
Home to 113 Elders, Grandvue Medical Care Facility has been serving Northern Michigan for over 120 years. The facility has evolved from a working farm in 1898 to an infirmary with x-ray and maternity ward in 1949 to a Medical Care Facility in 1958. A specialized memory community was added in 1997, and the facility was expanded and renovated in 2005. 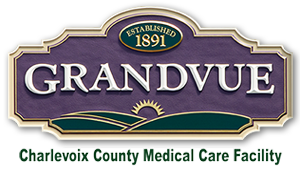 As a county medical care facility, Grandvue is owned by Charlevoix County and governed by the Charlevoix County Department of Health and Human Services Board. We are looking for a few friendly faces to complete our team! Grandvue has openings for caring professionals in our Housekeeping, Dietary and Laundry departments. RN, LPN and CNA positions also available with new flexible scheduling options. Outstanding benefit package for full time care partners. Fill out an application today or call Jane Korthase at (231) 536-2286 with any questions. 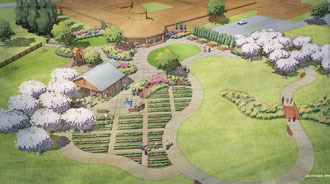 Thanks to community support, Grandvue Medical Care Facility is thrilled to announce that the fundraising goal for the Grandvue Terrace and Recreation Park has been reached, and development of the one-acre outdoor area is planned for 2019.